Community Legion - Super Barley Bros!Super Barley Bros! A single word – packed with so much meaning, history and symbolism – which is so very fitting for this huge, multi-faceted brew. This beer style is so named because of the 18th century Russian Empress Catherine II’s love for a similar dark, roasty, strong porter brewed in London and shipped to the Russian court. Hallmarks of the style are rich maltiness from the massive grain bill, deep roast and chocolate character from highly kilned malts, all balanced by an elevated bitterness, hop flavor and alcohol content. Lacking the intensely bitter, burnt character of many stouts, we think it’s roasty in all the right places, with a velvety mouthfeel and smooth finish. 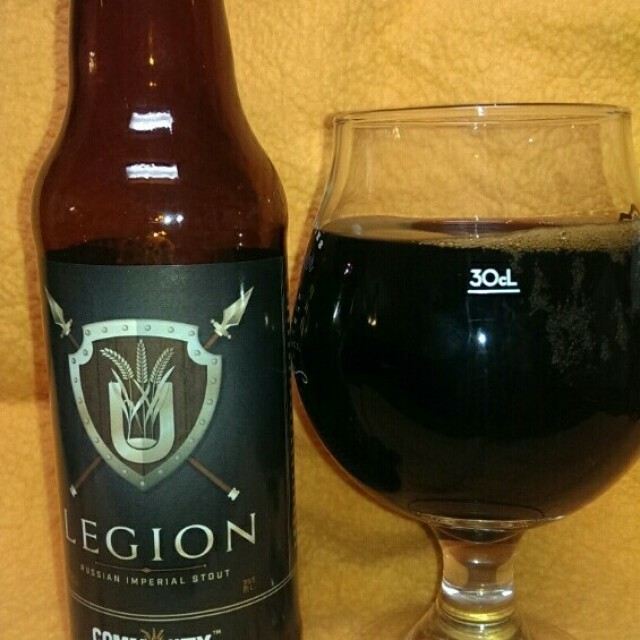 Community Beer Company’s legion of beer lovers grows larger every day, and this massive Russian Imperial Stout transcends rank and echelon! Welcome to our Legion. Black as Texas crude, our Russian-Style Imperial Stout allures with its thick, tan head and aromas of bittersweet cocoa and roasted malt. Twelve different malts compose the grist of this beer, adding layers of complexity and significant alcohol content. Hops are at play as well, coming from several nationalities, all adding their telltale terroir to the aroma and flavor of this huge beer. Bitterness from hops plays only a balancing role though, with the focus landing on the delicious blend of English Maris Otter, dark crystal and highly roasted black malt. We’ve got lots of things planned for this beer including barrel aging, special spiced versions, and more! Pours a beautiful black with a tan head. Aroma is slightly bittersweet, dark chocolate, malty. Flavor is warm, inviting, light bitterness with a hint of sweetness. Mouthfeel is smooth and slightly slick on the after taste. Sold in a 4-pack in 12oz bottles. I’ll probably finish this pack off during Extra-Life this weekend and purchase another to cellar. Lakewood Brewing Co 2nd Anniversary Bash!